In the monumentística offer of the city occupies an important place San Luis Castle. Located in the town center, its construction dates from the early sixteenth century. Other important remains to visit are the Castle of El Nicio, the ninth century and the Tower of the destroyed Church of the Fortress, Clock Tower, the XV century. This tower of Arab origin, was probably the minaret of a mosque; but with the Catholic conquest, it became church and tower, belfry. The Church of Our Lady of Remedios, the eighteenth century, was occupied until the nineteenth century by Franciscan priests. In it a curious mix of rococo styles with others, typical of the colonial architecture of Hispanic America is observed. The watchtowers are of Muslim origin, vestiges of the defense system of the coast, and the use of which lasted until the nineteenth century. In the Christian era, and to protect the area from pirates, put in place a bright night system smoke signals between tower and tower, and with which it warned of swift form of a possible enemy landing. Along the 21 kilometers of coast Estepona, we found 7 towers: Arroyo Vaquero Beacon tower, the Tower of Saladavieja or old helmet, the Padron or Paredón; of Velerín, very close to the prestigious El Velerin, the Guadalmansa or Desmochada, located in the green zone of urbanization CABO BERMEJO, the Saladillo and Casasola or Baños. The natural environment of Estepona also offers possibilities, such as the Pedregales Park, where the enclave is called Castillejos. In this place, on top of a hill, we found the remains of a prehistoric fortification, rebuilt by Muslims. Another natural area for visiting is the next to Guadalmansa river. Here we find the remains of a Roman villa, the beacon tower of the same name and an interpretation center of the site. Of interest is also the visit to Selwo Park, located on Highway Costa del Sol. In it we find wild animals living is semi-liberty, reproducing the living conditions of the different species. The mountain landscape in Estepona Sierra Bermeja the Stars, which owes its name to the peculiar red color of its soil, due to the high level of iron in their composition. It highlights the peak of "The Royals" with 1449 meters of altitude, from whose height can contemplate a magnificent view of the Costa del Sol, the Rock of Gibraltar and even the coast of Morocco on clear days. 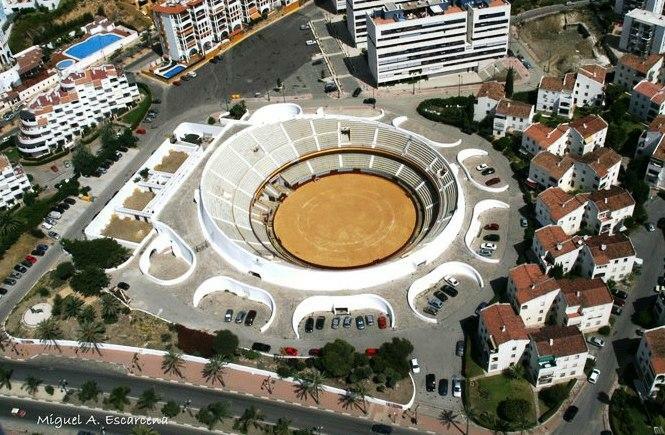 And the peculiar bullring, inaugurated in 1972, which by its asymmetrical design is unique in the world. The city also has an archaeological museum, which collected the remains have been found in and around it. The so-called "Piloceno of Estepona" or municipal Paleontological Museum, the Museo Taurino "Antonio Ordóñez" and the municipal ethnographic museum "Aperos Field and Sea", complete the museum offer of Estepona. Finally, it should not be ruled out a visit to the select developments that populate the area. Especially luxurious and spectacular for its buildings and gardens, are those found between Puerto Banus, San Pedro and Estepona, among which we highlight the exclusive development DUNES PARK, luxurious ensemble featuring hotel and apartments Hacienda Andalusian style located on the beach, with beautiful views of the sea, the African coast and surrounded by lush gardens. Another of them, URBANIZATION THE BELFRY, located in the same area, between the sea and the mountains, surrounded by golf courses, and endowed with the natural beauty of the area. 4.5 of 5 based on 1070 votes.